Brand New, Beautiful, Custom, Luxury, Peaceful 5 Br Home In Village! Walk To Everything From This Stunning New Home On A Quiet Street. This is our newly completed family getaway. We designed a home to make the time we spend in Leland comfortable, happy and memorable. It's bright, well appointed and beautiful. It has 10 foot ceilings on main and 9 foot up and down. It is 3,600 SF with three bedrooms up and two bedrooms on basement level. There are quality finishes throughout. Hardwood maple floors, big closets, huge pantry, study alcove, beautiful kitchen, cast iron claw foot tub, stone masonry fireplace, Cable TV, WiFi, Carrera marble countertops in all bathrooms, quartz in the kitchen, excellent mattresses, beautifully landscaped. We love how it turned out and since we can't be there all the time, we are renting it on a very limited basis to people who will treat it as well as we do. Our house is a block and half from access to Lake Leelanau and a 7 minute bike ride to Lake Michigan. Leland is a wonderful place which is why we decided to build here after vacationing for five summers. People here say it's a small town with a big reach. You will meet people from all over who visit here every summer which makes it very interesting. Our kids love that they leave on their bikes and can choose to go to several beaches on Lake Michigan or Lake Leelanau, hang out with friends at River and Main (an old fashioned candy store), get whatever food they need at the Merc and experience independence in a safe place. We love that we can walk or ride our bikes to dinner, coffee shops, beaches, bookstore or library, etc and then come back to relax in our beautiful home. Each lake has something different to offer and I love that you can choose the one you are in the mood for. The surrounding area is beautiful. I pick all kinds of berries in the summer and make jams and pies (some supplies are at the house). There are art festivals, wine festivals, music festivals, book festivals galore. Farmers markets abound on different days in different towns. Northport and Suttons Bay, towns closest to Leland and fun trips. Interlochen Performing Arts School is 40 minutes away and last year we saw several memorable performances there. There really is so much to do that we spend most of our summer here and never do it all! We live in Virginia which is wonderful most of the year but the summers are hot and humid. We began looking for a place to vacation that had a cooler climate. It had to have very specific qualities so it took about ten years to find it. Leland has everything we were looking for; cool, gorgeous summer weather, plenty for all of us to do without getting in a car, a safe environment for kids to ride their bikes and experience their own adventures, an abundance of natural beauty and a friendly feel. So after renting for several years, we decided to build our own house (the rental houses aren't great). This is our family cottage which we custom designed and built to have everything to give us a comfortable and beautiful retreat. We rent it on a very limited basis when we aren't in Leland. Most houses available for rent in Leland are old, dark and just not comfortable. While we loved being in Leland, we didn't like staying in places that didn't have good mattresses or a decent set of knives. We have everything in this home that we need and want to use to spend 7 weeks there in the summer so it's well appointed and well stocked with all new appliances. It's bright, has tall ceilings and super cute. toilet, shower, Huge carrera countertop so kids won't fight for space! toilet, Custom plank tiles and carrera counter, so stylish! toilet, combination tub/shower, Love the black and white tile with teal accents! I found the best LG Steam washer and dryer and installed them, you will find all the washing supplies you will need! Awesome LG Steam washer and dryer set! There is a living room and a family room and another family room in the basement. Top rated Kenmore Elite, LOVE this fridge for ease of use, storage space and flexibility. Top rated Samsung gas range and oven. This gas oven bakes beautifully, it's still so new and clean. We had fun making pancakes on the center griddle. Samsung gas oven, if you haven't baked or roasted with gas yet, you are in for a treat. New top rated Hamilton Beach. Wonderful Breville Smart Oven, I cook pizza's, quiches and bake in this! More than you need, plus all the easiest cleaning supplies, like a Dyson vacuum cleaner. I have this kitchen stocked with all the pots, pans, dishes and accessories you need. The pantry is enormous and the Silastone Quartz countertops are a joy to work with. Our reclaimed wood table from England seats 6 comfortably, 8 snugly. We also have 3 stools at the island. 55 inch Samsung TV with Cable! DirecTV for all your favorite channels. I have one in the basement family room with a couple of hundred DVDs. We have a bookcase with an eclectic collection in the basement family room. We have a great selection of board games, a hand carved chess set and a few puzzles in the basement family room. I don't know how many DVDs we have in the basement family room but it must be over 200! No, we avoid these on vacation. Beautiful open lawn in the back surrounded by woods. You can rent these right in town. In season we make a couple of bikes available. There is a large front porch where we often eat dinner. There is also a small back porch. Tennis is close by at the public courts up Juniper Trail and around the corner. There are many public golf courses in the area. We have beautiful leather furniture in the upstairs family room, wonderful for napping. Ceiling fans throughout (nice ones), an adorable mudroom with it's own entrance and BIG closet. Group of five women celebrating our birthdays. Home was warm and welcoming and very clean. Location was perfect for shopping in the quaint town, dining in delicious restaurants and touring the local wineries. Owner was responsive and helpful. Can hardly wait to go back. Nice house, good location, reasonable expectations. I would definitely stay here again. The house is a well loved, well kept, model home that is beautiful inside and out. 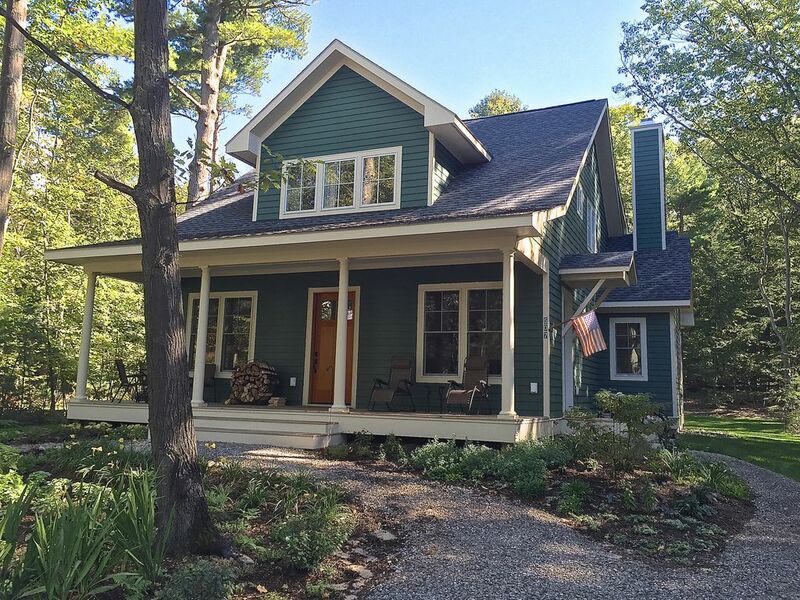 The house is in a wonderful area of Leland in easy walking distance to lakes Leelanau and Michigan and downtown Leland. This is a dream cottage/house and has plenty of room for a family and friends. If you want to stay in Leland, this is the place to stay. This is our 2nd time renting this home. We had a great week last time and this time as well. Highly recommend this home. Beautiful home, tastefully decorated and convenient location. Spent the weekend at this lovely home in Leland located at the end of a quiet street. It was beautiful and had everything we needed except live TV. We don't normally watch very much TV while on vacation but we wanted to watch the NBA finals but for some reason we could not figure it out. We left a message with the local contact person who didn't return our call. Fortunately we were able to watch it on our cell phone, always good to have a "Plan B". Thanks for sharing your home with us. I'm not sure why this happened, I think the Roku software needed an update. When we got here we got it working pretty quickly. I'm sorry it didn't work for you! We stayed for a long weekend in this home. It truly is a ‘home away from home’. Very comfortable, well cared for, couldn’t think of anything that was lacking. Great location! Near restaurants, a winery, a grocery store and close to lake. Owner is very pleasant and great communication back and forth. Would love to stay here again!! This home is beautiful. It has everything you need for a group to stay. 3 living room areas to spread out and cackle as a group or escape to another area to read. Kitchen well equipped. Very spacious home with comfortable beds! Thank you for sharing your home. Thank you for the lovely review! We did want places to retreat and have some quiet so we made sure to build the house that way, thank you for noticing :). Reservations are not confirmed until payment is received. Holidays are 3-4-night minimums (depending on the holiday) at $500 per night. VRBO doesn't let me enter them since the dates overlap with my Fall/Spring Rate but I can send you a payment request if you note which Holiday you are interested in.